For nearly a year, the Marine Corps’ top officials have stayed on message with two main points regarding manpower: A drawdown wouldn’t begin until after the war in Afghanistan, and it would reduce the service to 186,800 Marines. Those points were reinforced early this year with the release of the Corps’ force-structure review recommendations. It called for a 13 percent reduction in ground combat forces, but stuck with that 186,800 end-strength figure. It’s time for a reality check. In light of the nation’s financial trouble, that plan may not be feasible. 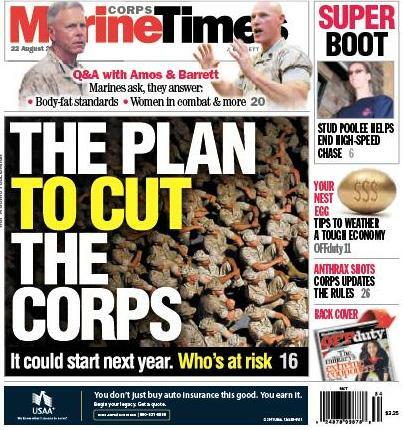 In this week’s Marine Corps Times cover story, we outline what could happen instead, relying on interviews with top service officials, past reporting and a look at previous drawdowns. Commandant Gen. Jim Amos acknowledges that force reductions could now begin as soon fiscal 2013, which begins next October. He and Sgt. Maj. Mike Barrett, the Corps’ top enlisted Marine, offer up their thoughts and advice to Marines, but acknowledge life in the Corps will soon be a whole lot more competitive. To check the story out, pick up this week’s Marine Corps Times on newsstands. You also can read it online by subscribing here. The United States tried this reduction back in the Clinton era and as soon as the need arose for our Marine Corps to step back into battle, we were caught short-handed, under-staffed, and not combat ready to do our job. The best thing that America can do is look at reducing the Army and leave the Marine Corps where it is and allow them to re-build back up to full strength of 250,000, lest we get ourselves into yet another financial crisis in trying to re-build the Marine Corps numbers at the last minute. This nation is on the brink and letting go of the Devil Dogs is the worst decision that ANY American could make. Trim back the occupying forces and keep the quick responders ready. Give the MArines the equipment usually given to the Army troops that are down-sized too. I am a Marine Corporal that was forced out due to lack of boat spaces. I am an outstanding Marine with high recamendationes from my chain of comand. The only thing I want to do is be a Marine, and I was let go while BCP Marines get to stay, and reenlist. I think the higher ups need to searousley review what is going on, and ensure the right Marines are staying, and the s***bags are getting out. I fear the Marine Corps could loose there reputation if this problem is not addresed in a timely maned.